A good friend of mine is Albanian. She lives on the East Coast now, but she grew up in Albania watching Italian cartoons with her two sisters and a big family. One of the nights that cemented our friendship in sophomore year of college, she taught several of our neighbors in our dorm how to do an Albanian dance while listening to Albanian music. She taught me to say “I love you” in Albanian when I gathered languages for a valentine. But the most important piece of Albanian culture she shared, to me, was teaching me to make a rice dish from Albania during a dinner party she threw. 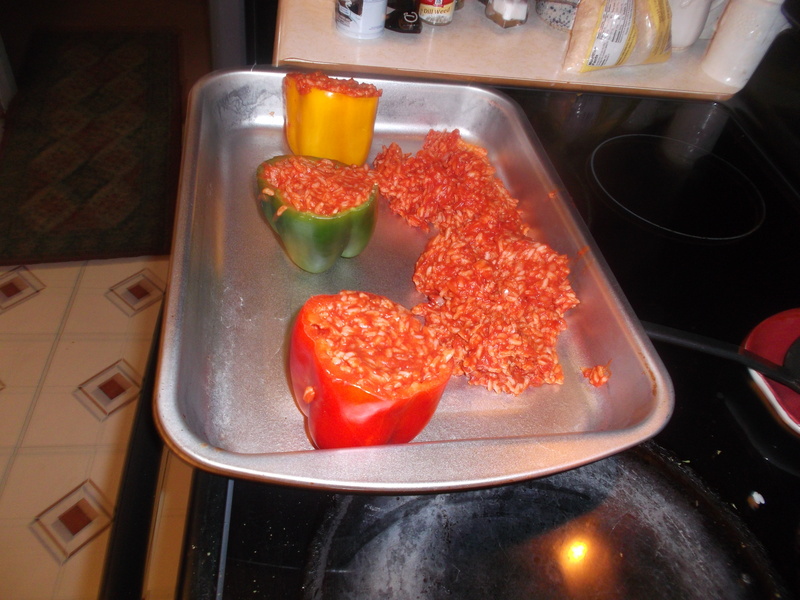 I then made this rice stuffed peppers dish for my family back in Missouri and surprisingly everyone loved it. Even my grandmother who never tries foods she hasn’t eaten before loved it. So, go forth and rice…ricify? Ricify. 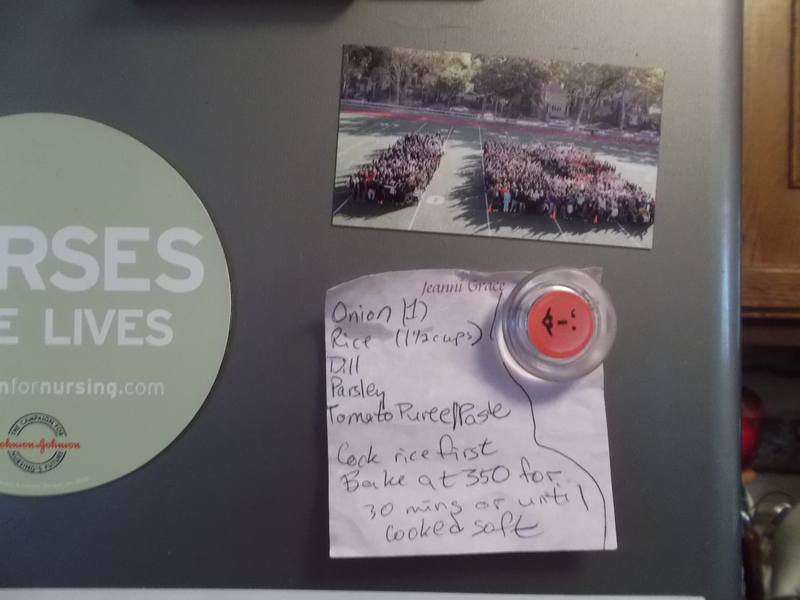 Yes, this is how I kept my recipes before this blog. The recipe was originally posted on this translation site, but I’ve made a few small changes to it. To begin with, gather the following: 3 bell peppers, several cups of rice, several cups of water, a little butter, 1 can of tomato paste, a few slices of onions, dill weed, and parsley. I used 2 cups of rice and 3.5 cups of water. This did leave me with quite a bit of extra rice, but better extra than too little. You can always use the extra rice in another dish. Not pictured: three bell peppers. Put your water on to boil with a teaspoonful of butter. 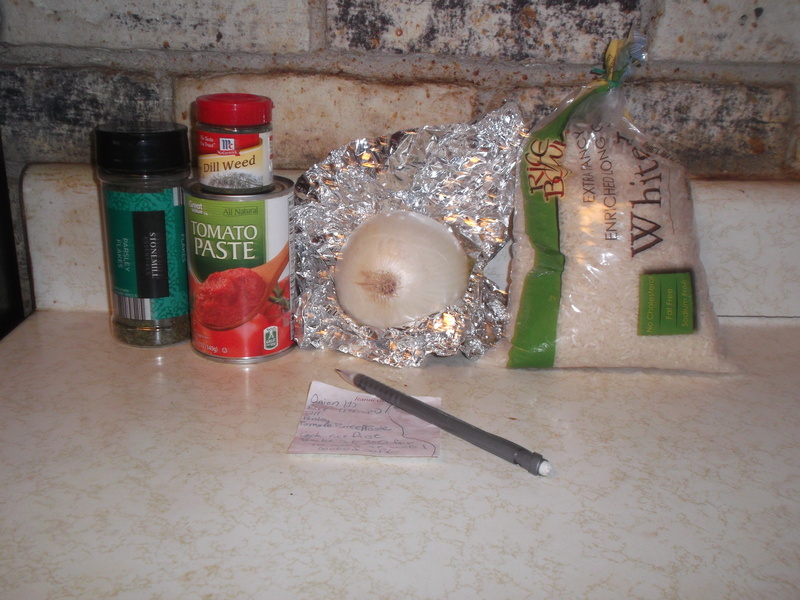 While the water is boiling measure out your rice and slice up some onion. I used about 2 slices of white onion, but you can add to your liking. Get a large frying pan/sauce pan, and open your can of tomato paste. Dump the tomato paste and the onion into the pan, then put the burner on medium. Add a few pinches of parsley and dill weed, going by the smell. If it’s too thick, which it probably will be, add some water until you like the consistency. Preheat your oven to 350, and spray a baking pan lightly. When the water boils, put your rice into it, and cook it according to the package instructions. If your package doesn’t have instructions, a quick google search will bring you lots of tutorials. Cook the rice so it’s nice and fluffy. 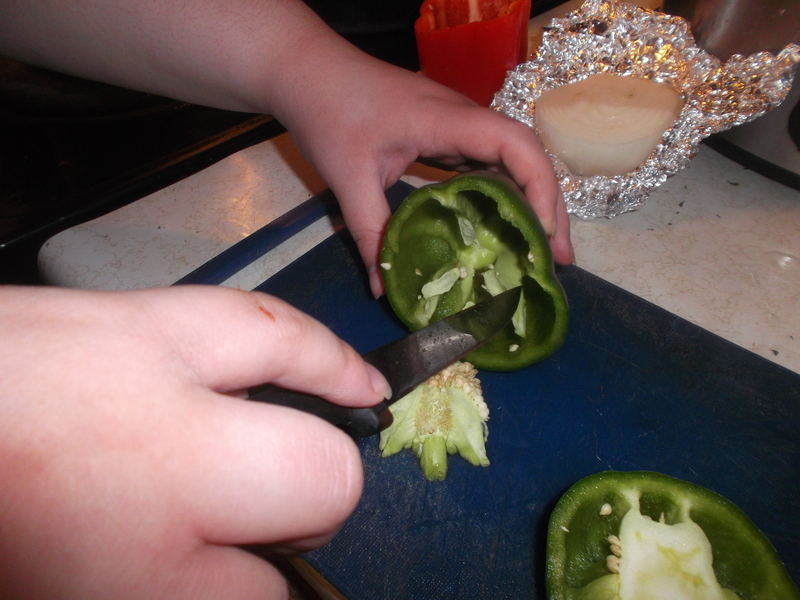 While the rice is cooking decapitate and disembowel your peppers. 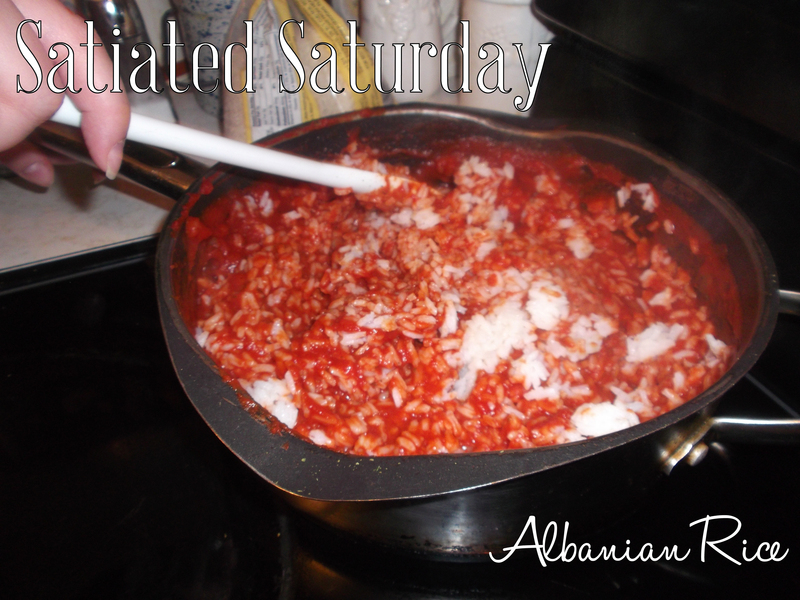 Your sauce should be simmering quietly, so add some rice and turn the burner up a little. Keep adding rice until the rice has soaked up enough of the sauce that there’s not much extra. You’ll probably have a hard time not just eating it out of the pan, I know I did. Turn the heat off, give it about a minute to cool a little. 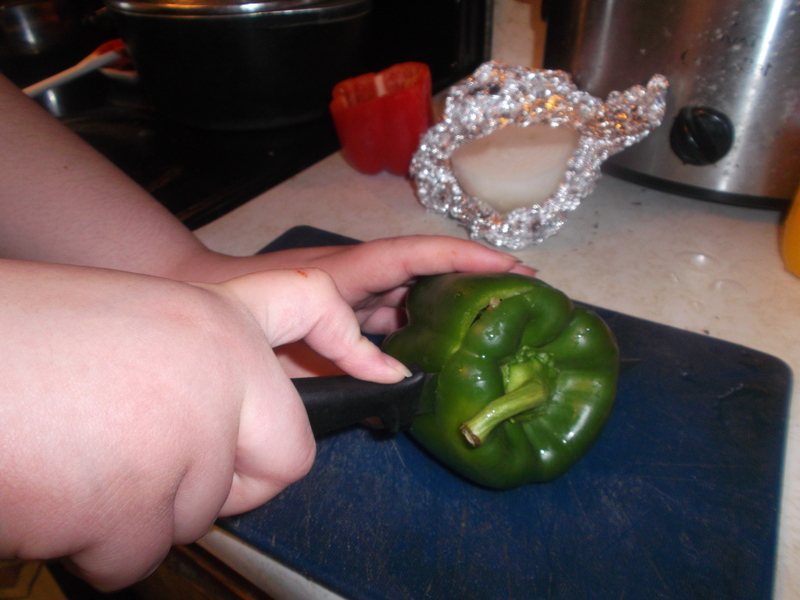 Then, take a nice big spoon and stuff your peppers with delicious rice. Stuff them as completely as you can. Put these peppers into your baking pan. If you have extra rice and want to, you can just put this rice into the pan and bake it as well. I did this, and it was extra delicious and kind of crunchy. Bake your rice and peppers for about 30 minutes. Pull it out and take a deep, deep sniff. Nom at will.